We have the best prime steaks in Merritt Island, Florida. We have a fantastic deli and a huge selection of gourmet foods. Try Our Professional Catering Services. Hayes Meats & Gourmet Foods has been proividing catering services and gourmet food to our loyal customers in Merritt Island, Cocoa, Cocoa Beach, Melbourne, and Brevard County since 1957. 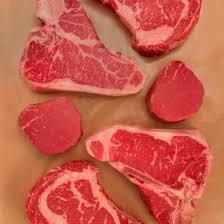 At our store you will find the best cuts of meat, including prime grade, which is the highest quality available. You will also find a wide variety of homemade salads, wines from around the world, Champagnes, and imported beers. Our customers feel at home as they enjoy our FREE beer while they browse and sample goodies from our deli. Hayes Meats & Gourmet Foods specializes in catering Parties, Weddings, Funerals, and Corporate Events. We can serve a variety of venues from an intimate ‘Romantic Dinner for Two,’ to a 1000 person corporate function. If you need help planning your event just call Gem or Connie at (321) 453-3550 for assistance. A new trend is developing in the gourmet foods industry, the home meal replacement concept. Busy working families would like to eat a gourmet meal in the comfort of their home but don’t want to pay restaurant prices. They then discover our unique store. We deliver cooked gourmet meals or fresh groceries to your home. Hayes Meats & Gourmet Foods has won the Better Business Awards in the past years. Gem says, “Everybody who works here SMILES. We pride ourselves on customer satisfaction and superb food quality. Our service is second to none!” His wife, Connie agrees, adding, “Our awesome staff will ALWAYS go the extra mile to make sure you walk out happy.” “Service & Food Quality is why I come here,” says one loyal customer, Bob Jankowski. “I’d pay more to get this service, but your prices are very reasonable,” says Jankowski.